Re-certification courses are designed for candidates that need to renew previously certified certificates. Re-cert courses are significantly cheaper and shorter than original full courses. St Mark James Training is the elite provider of renewal programs to expiring certificate holders in Canada. It has the most flexible requirements and offers the largest number of renewal / re-certification programs out of any major provider. All of our training partners in Canada (click here to view training partners) offer St Mark James re-certification programs. Prior to registering candidates should determine whether they meet the renewal requirements set by St Mark James.To be eligible for a St Mark James CPR re-cert course candidates must meet the prerequisites advertised below. Have a certificate from a credible provider such as St Mark James, Vancouver First Aid, Heart and Stroke Foundation or St. Johns Ambulance (participants in Ontario must have previous award with a St Mark James provider and may not take consecutive re-certification courses). Have completed a re-cert course or a full course in Canada within the past 3 years. Bring the previous certificate obtained from a credible provider. Candidates that do not meet this requirements will not be eligible for a renewal / re-certification course and must retake the full course to obtain certification. Candidates that have taken online courses will not be eligible for certification. Only courses that involve hands on training through credible providers can take a re-cert course. Stay certified in CPR by taking a St Mark James CPR re-cert course. Renewal awards provided to candidates after certification are valid for 3 years. Candidates may be required to renew certification at a earlier date based on requirements from employers, work policy or academic requirements. CPR re-certifications awarded to candidates come as wallet sized certificate and meet government, academic and workplace requirements. Candidates are required to complete a skills component and a short multiple choice test prior to successfully completing the course. If you have any questions about renewal courses in your region visit one of our elite St Mark James CPR re-certification providers from our locations page. Participants that register with our training partners for can be certain that they will receive the highest level of training available. All courses provided through St Mark James are kept constantly updated by a number of committees such as the American Heart Association and the International Liaison Committee on Resuscitation. 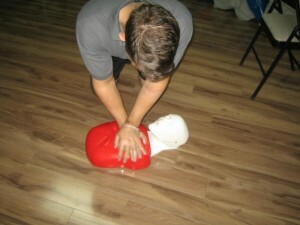 Check the most up-to-date CPR methods and techniques in the video posted below.